If ever the term “super group” should be applied to a punk rock band, Only Crime fits the bill. The band formed in 2003 when vocalist Russ Rankin (Good Riddance) and guitarist Aaron Dalbec (Bane, Converge) realized they would have the time to pursue a band together; something they had talked about during a Good Riddance/Bane summer tour. Needing another guitarist to round out the sound, the two contacted Zach Blair (Gwar, Hagfish, Armstrong, and later, Rise Against) who signed on instantly. Despite the trio being scattered across the country, they began writing the original batch of Only Crime material, as well searching for a permanent bassist and drummer. The lineup would finally come together with drummer Bill Stevenson (Descendents, ALL, Black Flag) and bassist Doni Blair (Hagfish, Armstrong, and later, The Toadies) who joined the group just as they were preparing for their first recording. In early 2004 the band recorded material which would eventually comprise their debut release at the Blasting Room studio in Ft. Collins, Colorado. By the spring of that year Fat Wreck Chords had signed Only Crime and the first album, entitled “To the Nines” was released in July. Only Crime was in the midst of a hectic summer schedule which saw them play a string of dates with Bane and Stretch Arm Strong between extended runs on the Van’s Warped Tour which covered the eastern US and Canada. Between the fall of 2004 and the spring of 2005, Only Crime toured the midwestern U.S. with Avail, the West Coast twice; first with Strung Out and then again with Rise Against, joined Lagwagon for the Fat Wreck Chords Japanese Tour and then finally headed to Europe to join the Deconstruction Tour where they shared the stage with the Mad Caddies, Boy Sets Fire and Strike Anywhere. Only Crime spent much of 2005-2006 convening at the Blasting Room for writing sessions as they began developing their second full-length album. The resulting material highlights the band’s cohesion and musical direction after over two years of playing together. “Virulence”, was released on Fat Wreck Chords, and not only picked up where “To the Nines” left off, but it utterly surpassed it. Using rhythmic experimentation and ambitious arrangements, “Virulence” set a new standard. 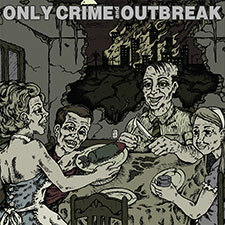 Fast forward to 2007 and Only Crime teamed up with Outbreak for a split release via Think Fast. Each band contributes two new songs. The vinyl is long sold out but you can pick it up on iTunes (and maybe Bandcamp someday if we can ever dig up the master!). Most recently, Only Crime has seen a fair share of lineup changes, including Zach Blair who moved onto Rise Against, and brother Doni Blair who now plays in The Toadies. 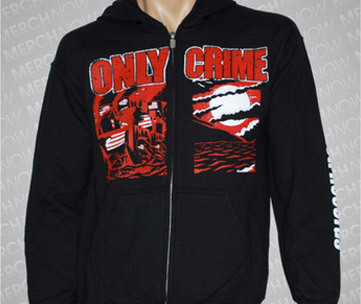 In 2014, Only Crime signed to Rise Records and released their third full length.